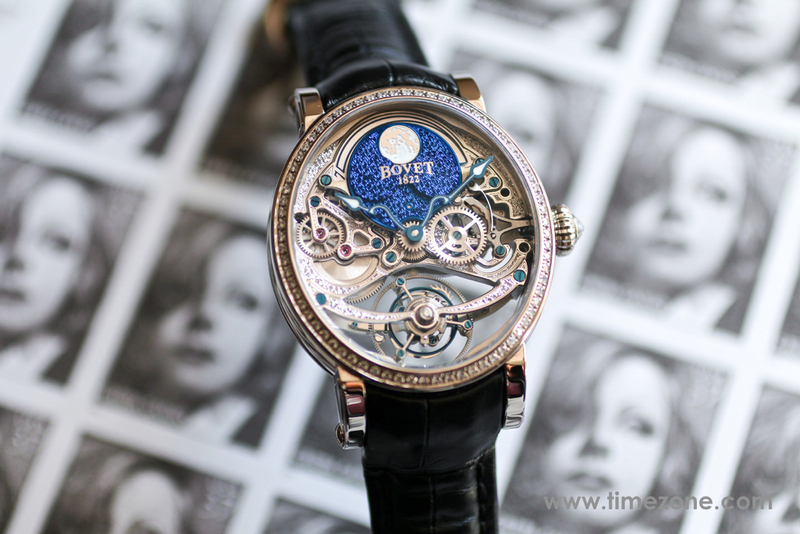 Bovet provided TimeZone with the unique opportunity to extensively review the Bovet Récital 9 Miss Alexandra 7-day tourbillon with precision moon phase. 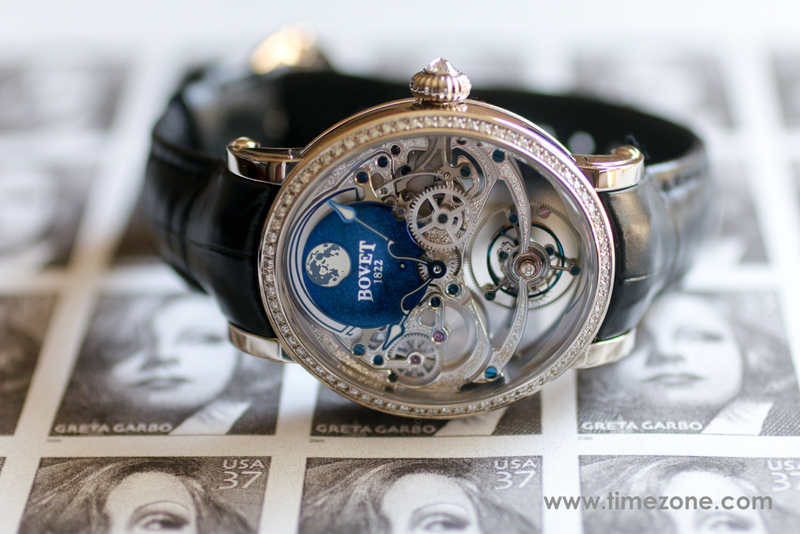 Exclusive to just 50 editions, this white gold Récital 9 is a rare sight and happened to be the only one available in the United States at the time of this review. 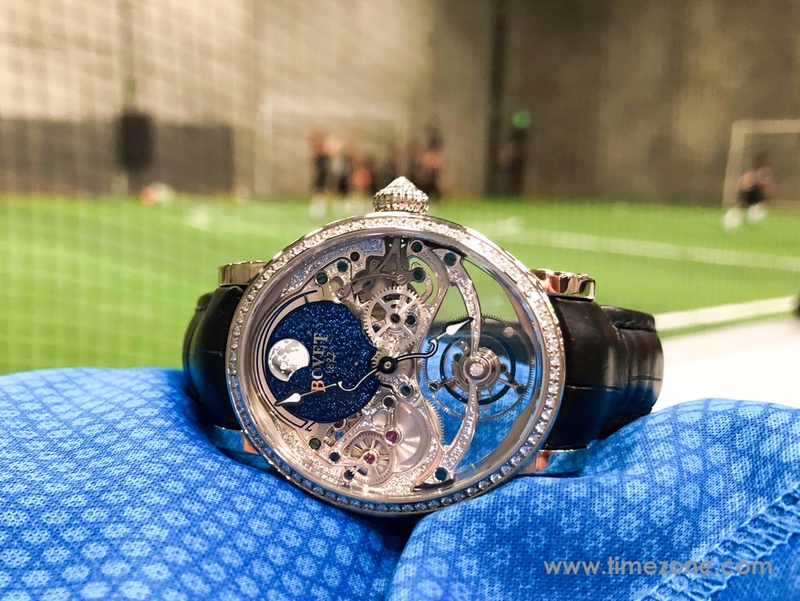 It was a pleasure to wear the Récital 9 for two weeks and with only a singular request by the maison, that I actually put it through the paces in order to provide this honest, candid review. 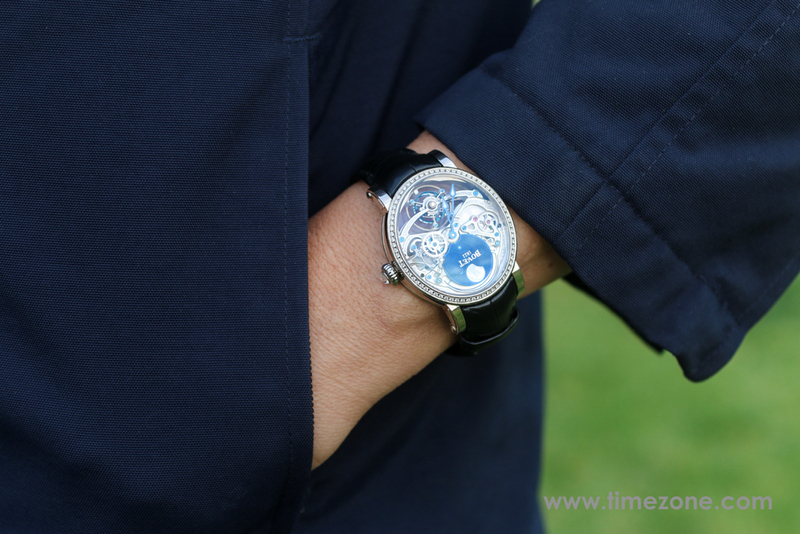 Similar with other reviews, I wore the watch daily and tested the accuracy of the timekeeping. Additionally, I had occasion to pressure test its water resistance. 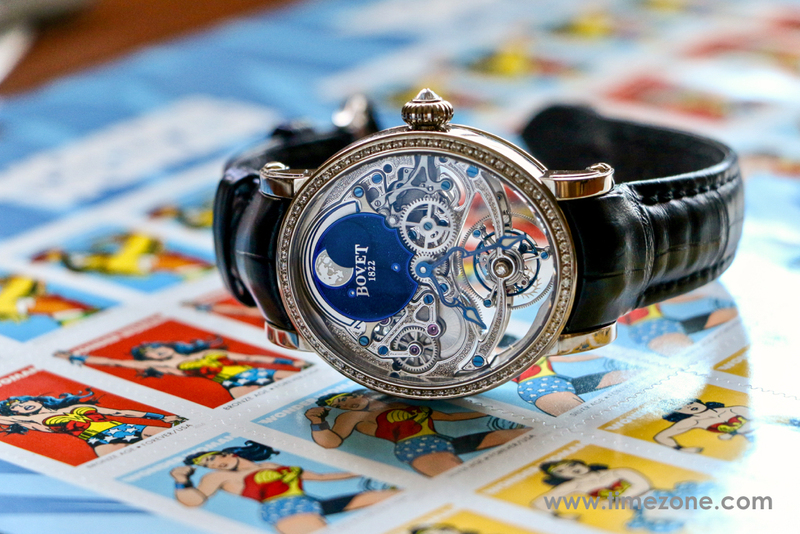 In short, the Récital 9 is a superbly crafted timepiece. 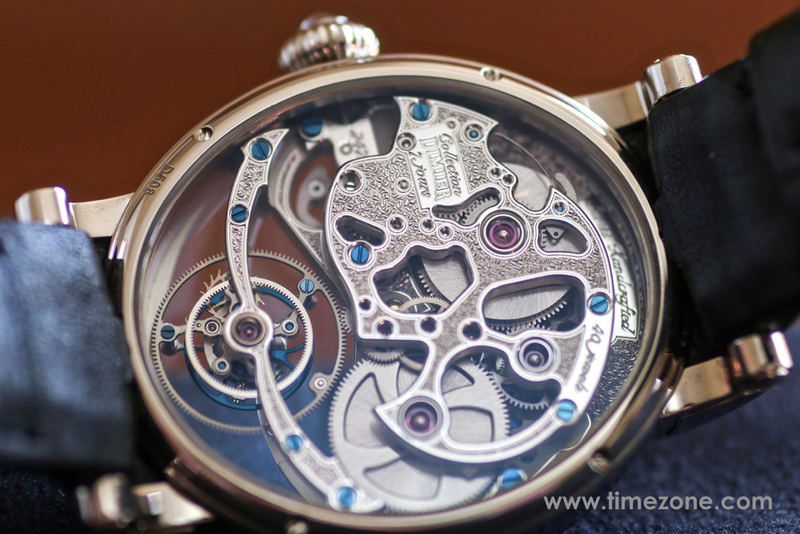 The movement is constructed between two hand-engraved 3/4 plates with a large opening for the tourbillon carriage. The tourbillon bridges resemble a wide smile, and the upper pivot of the tourbillon carriage is capped with a diamond endstone that adds a touch of theatre to the dial as it rotates with the tourbillon. 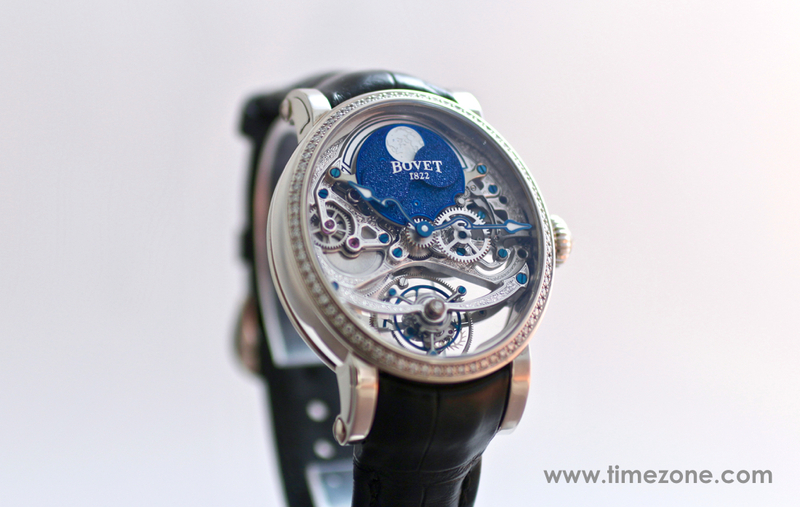 Jean-Frédéric Bovet was a Fleurier watchmaker in the late 18th century. 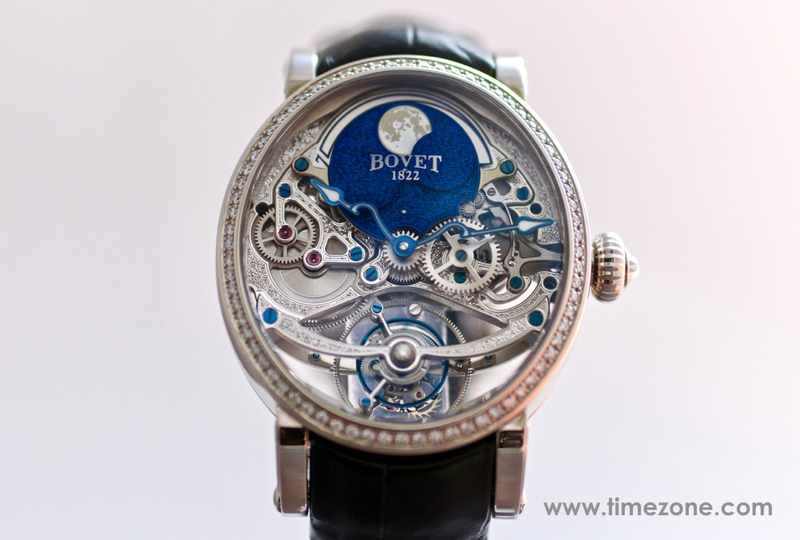 He sent his son Édouard Bovet to Canton, China to repair watches. 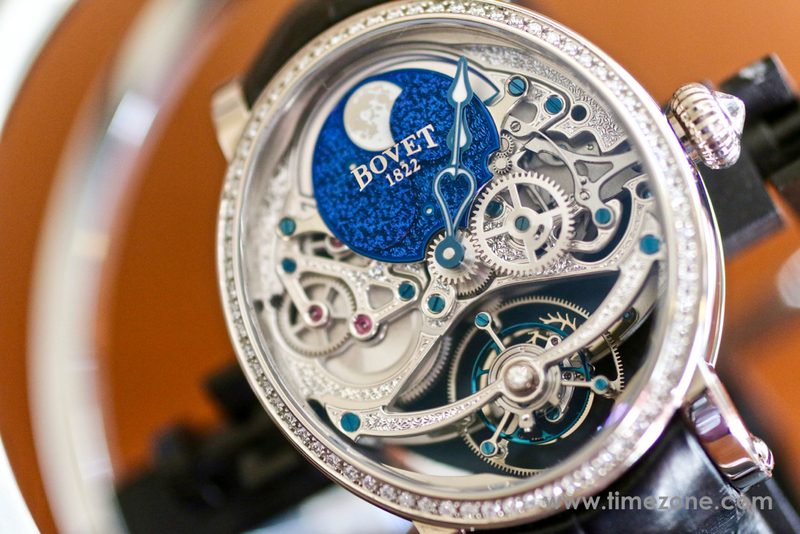 While in China, Édouard Bovet and his brothers founded the maison in 1822, producing ordinary pocket watches with luxurious finishes such as pearl, enamel artwork, display case backs, and jewels. These watches became famous during the Qing Dynasty and were often produced and sold in identical pairs in accordance with the Chinese custom to give valuable gifts in pairs. 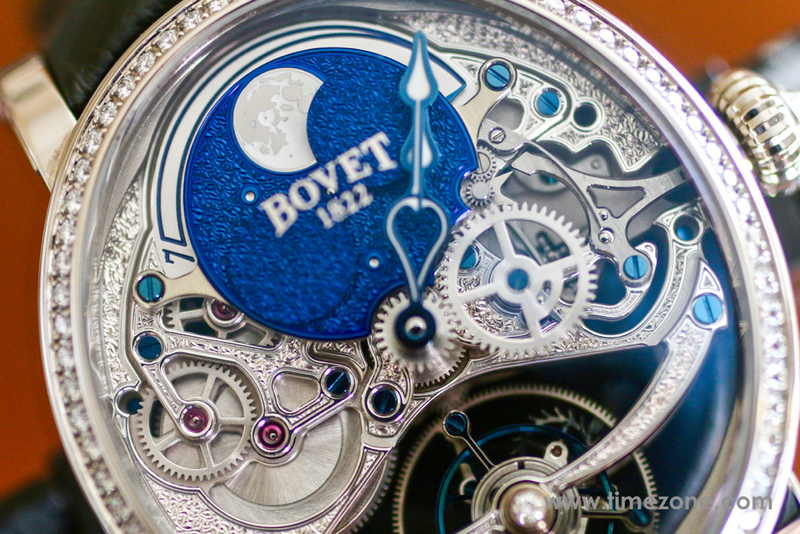 Their thriving trade established Bovet as a dominant manufacture, but when Edouard returned to Fleurier in 1830, he became part of a separatist movement against Prussian rule of the area. By the following year, he fled Fleurier to live in exile in Besançon. 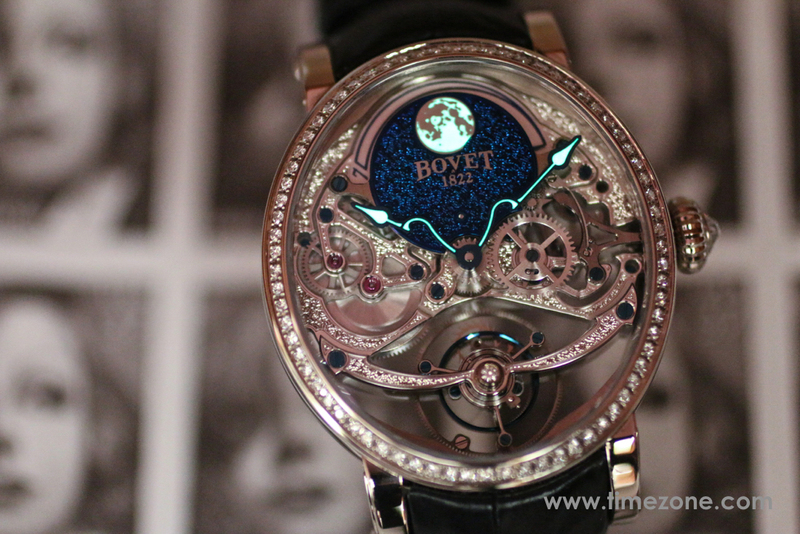 Bovet 1822 was acquired in 2001 by Pascal Raffy, who focuses on exclusive, handcrafted timepieces. 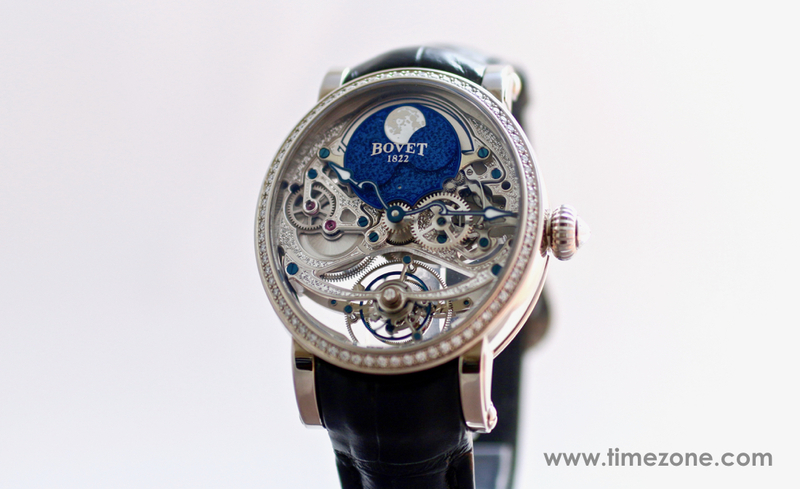 Raffy invested heavily in developing Bovet's manufacturing base to ensure supply and full autonomy by acquiring a minority of Aubert Complications in 2004, and ownership of STT Complications SA (tourbillons), STT Mechanical Movements SA (calibres), STT Spirit (hairsprings), as well as Aigat SA (stamping), STT Watch U Licence (patents) and Valor & Lopez (dials). 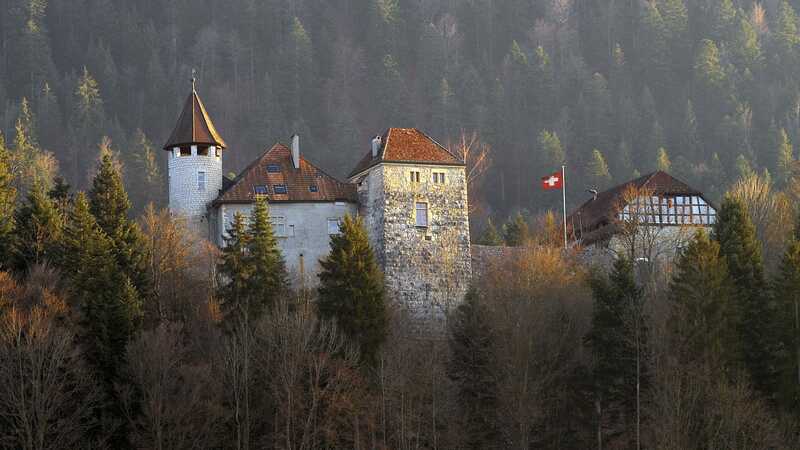 As a final feather in his cap, Raffy also acquired Chateau de Môtiers, the 5,800 square-meter castle that once belonged to the Bovet family. 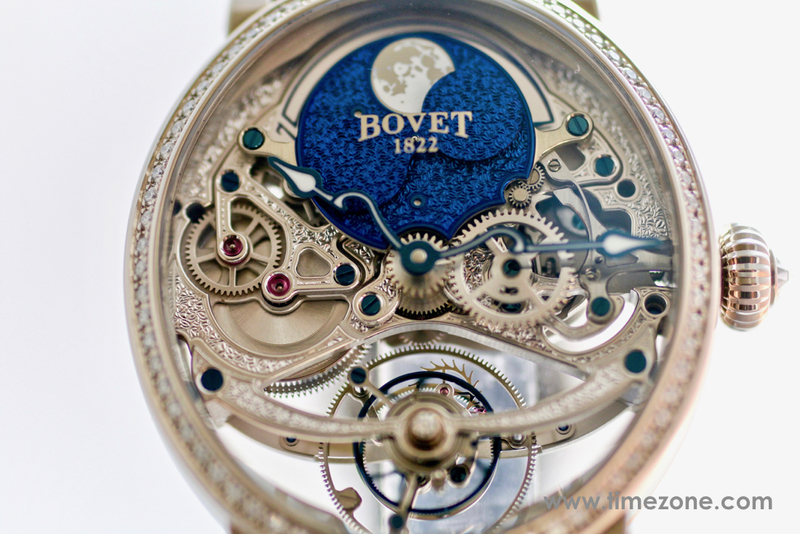 Today, the chateau houses the Bovet 1822 workshops, providing its watchmakers and artisans with breathtaking views across the Val-de-Travers. 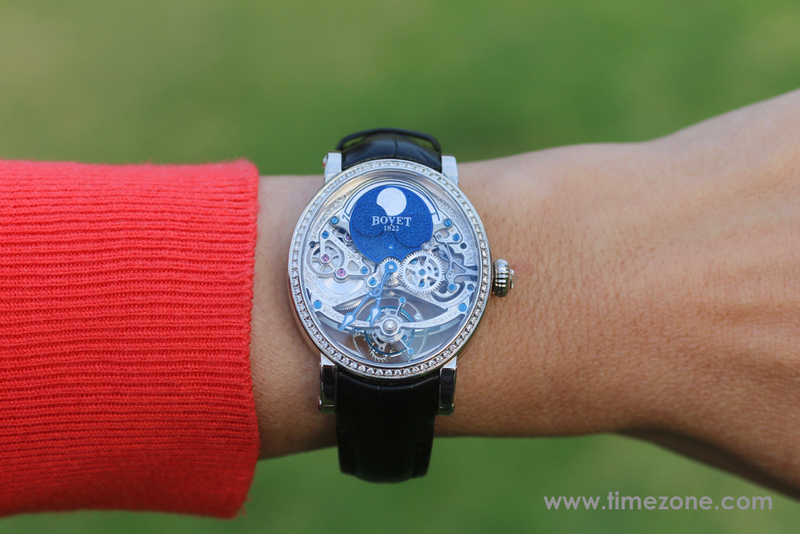 The Récital 9 features an oval case crafted in polished 18-carat white gold. 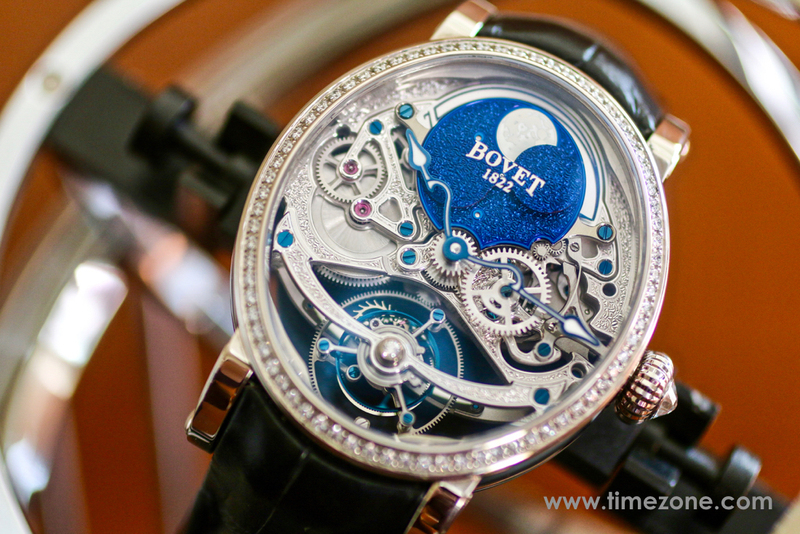 The bezel is set with 60 brilliant-cut diamonds (~0.34 tcw). 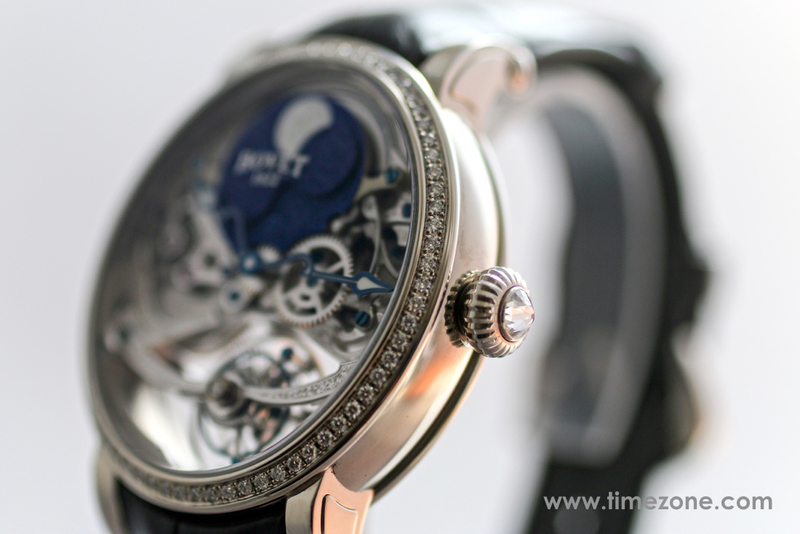 The case dimensions measure 41 mm long and 37.2 mm at the widest point. 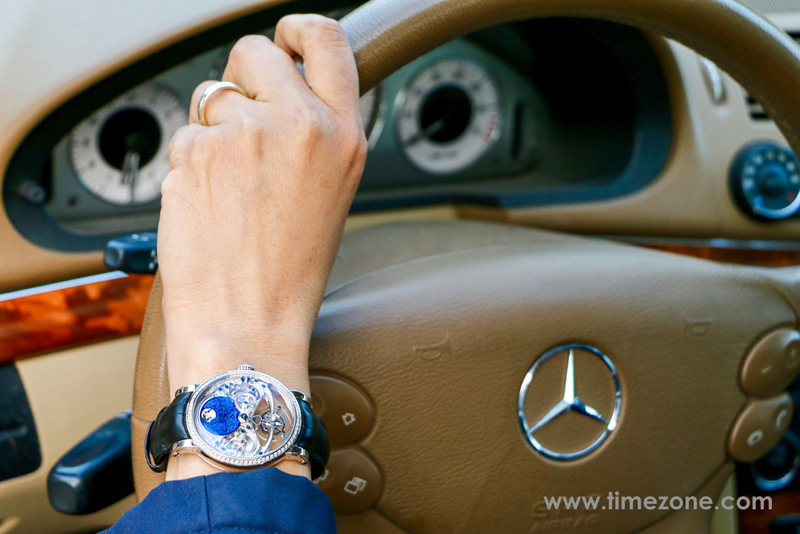 With a case thickness of 12.4 mm, the gently curved lugs ensure that the Récital 9 sits comfortably on a woman's wrist. 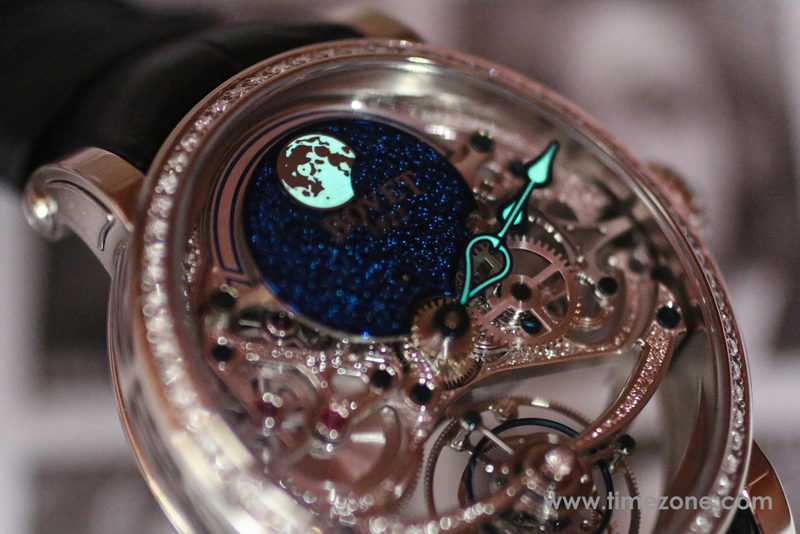 I had occasion to visit a local watchmaker who independently tested the case's water resistance. Although rated at 30-meters, this case is actually water resistant to 4.66-bar or 46 meters. While this level of water-resistance is generally safe for swimming, I wouldn't recommend swimming with the Récital 9. 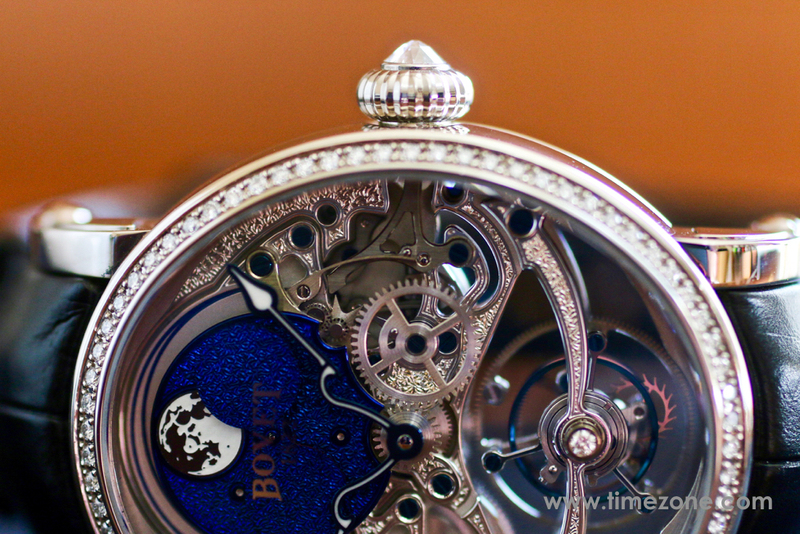 Instead, I read these results as evidence that the Bovet watchmakers are extra careful to use thick gaskets to help seal out moisture and dust. 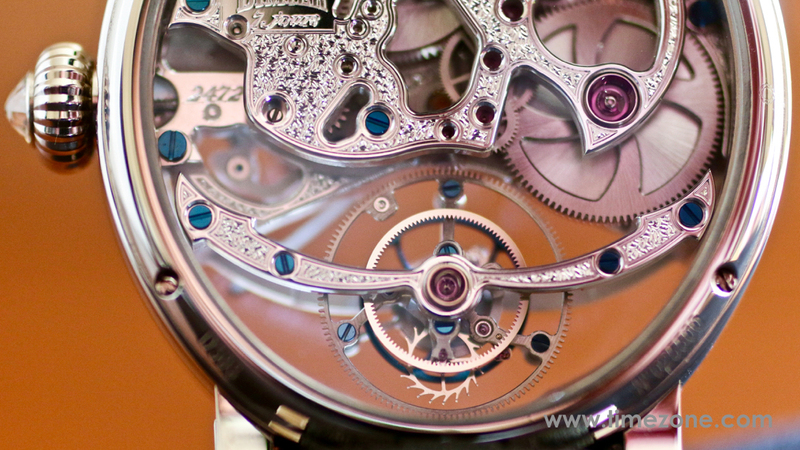 The openwork dial is designed to allow the large tourbillon cage to remain visible at all times. 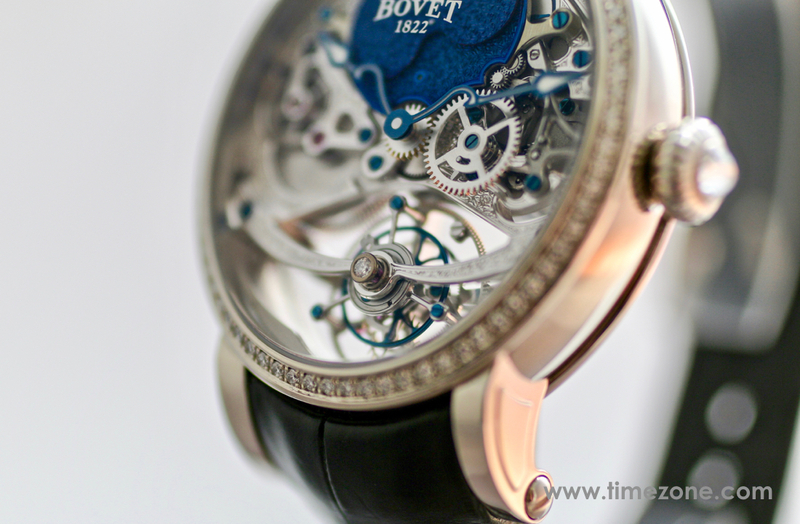 All the openwork is intricately hand-engraved to add depth to the dial surfaces. 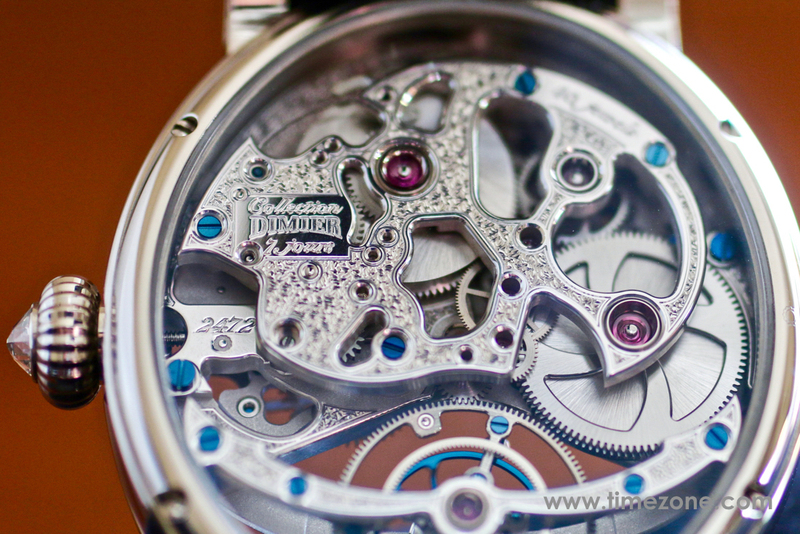 The heat-blued screws feature polished screw heads with a deep royal blue color that adds contrast to the dial. Beyond aesthetics, bluing the screws helps to increase corrosion resistance. Since watch screws are subjected to a lot of torsion force applied to them during assembly and servicing, watch screws are fabricated from carbon steel. Although carbon steel is a harder alloy than stainless steel, carbon steel is also more susceptible to oxidation and rust. Achieving a uniform color for different sized screws requires precision and the highest level of quality control since even a fraction of a degree variation can result in a different color. Once the perfect deep royal blue is achieved, the screw hears are hand polished to remove any surface contaminants. The hours & minutes are displayed by central hands. Every hour, the hands form a heart when the minutes hand rests on top of the hours hand. To further enhance legibility, the hands are treated with SuperLuminova. 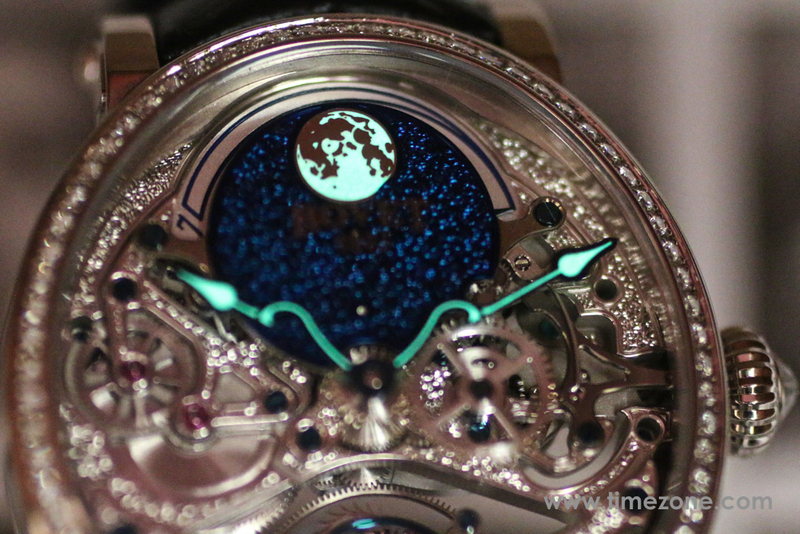 The sky surrounding the moon is hand engraved on a nickel silver plate, then PVD-treated to a deep blue. The overall effect is a glimmering night sky filled with stars. The moon is in a fixed position and two pallets reveal the phases of the moon. 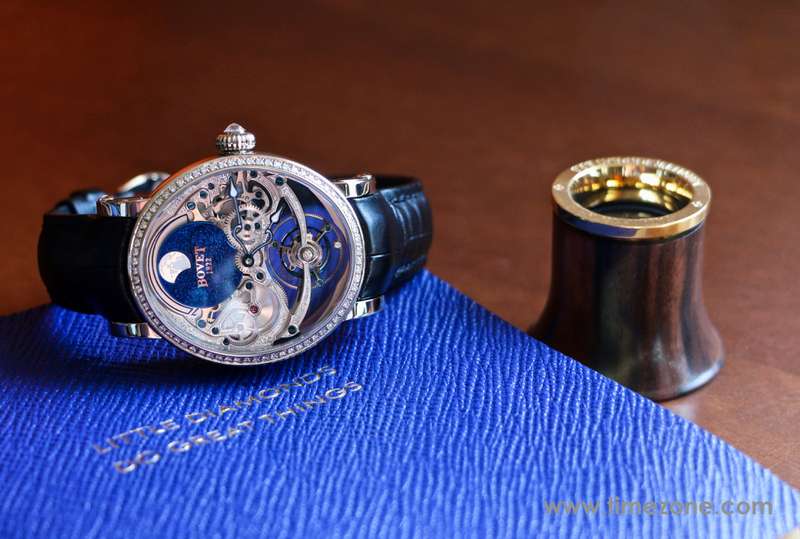 The 7-day power reserve indicator is discreetly integrated in an arch above the moonphase. 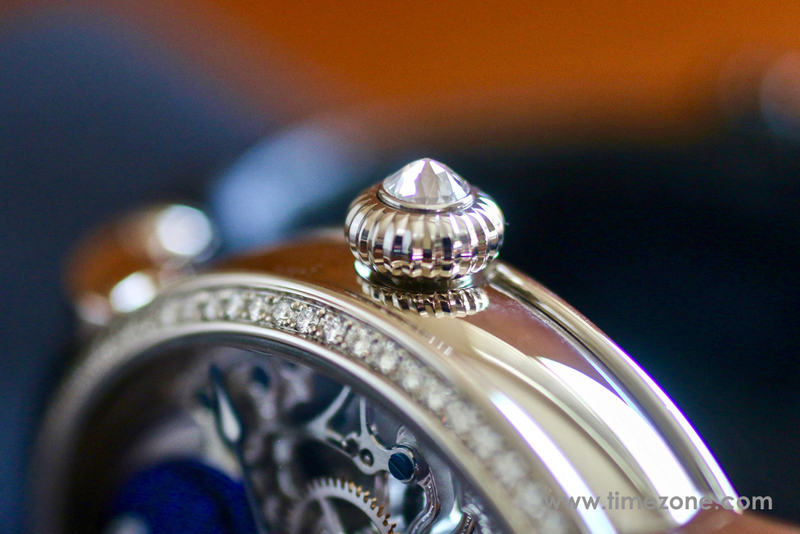 The tourbillon bridges resemble a wide smile, and the upper pivot of the tourbillon carriage is capped with a diamond endstone that rotates with the tourbillon. There is every attention to detail, including the 18-carat white gold crown with briolette (pear-shaped diamond). Not only gorgeous, the large crown is functional and easy to wind. The Recital 9 is not only aesthetically achieved, it is also technically innovative. The manufacture Caliber 15BM01-PL is designed and produced entirely in-house, including the hairsprings and tourbillon carriage. Master artisans spared no expense in lavishing every component with hand decoration, including engraving, polishing, anglage, chamfering or bevelling. Notably, the sharp edges of re-entrant angles and rounding-off of the tourbillon cage bridges can only be accomplished by hand. Tested over two weeks, the Récital 9 performed within COSC specifications with an accuracy of +5 seconds/day. 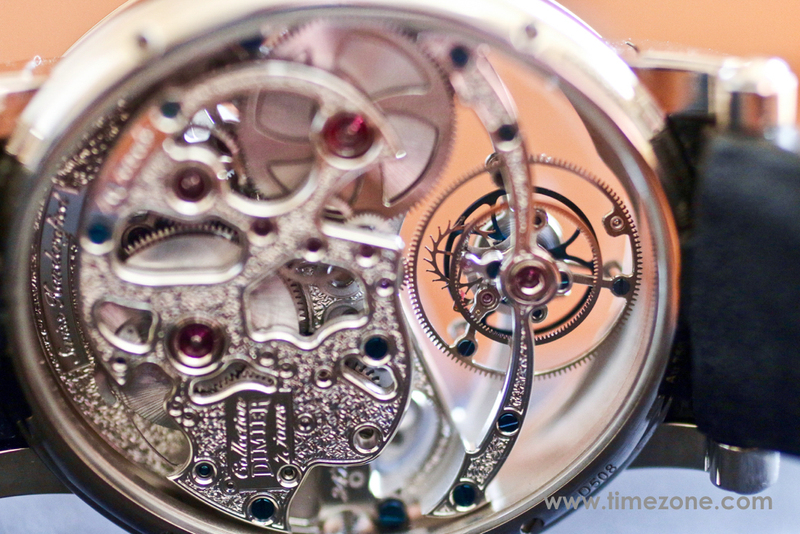 The tourbillon is set dramatically in its cage at 6 o'clock. The tourbillon was invented to counter the effects of gravity on the timepiece by placing its regulating organ in a vertical axis. 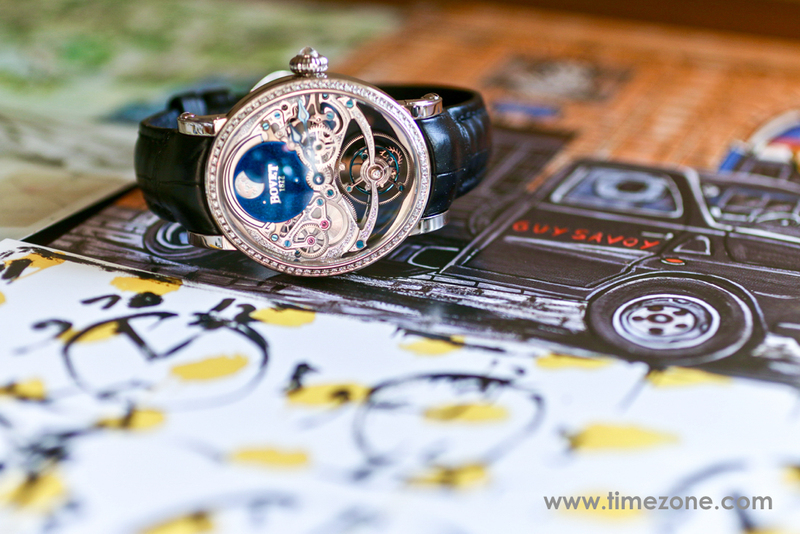 This is significant for when the timepiece is used as a pocket watch or a table clock. 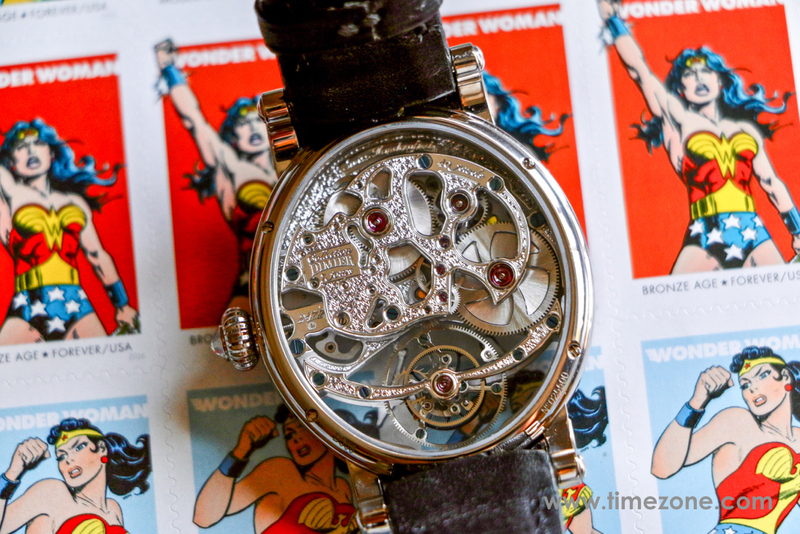 The dimensions of the sizable tourbillon, its inertia, and the design of the balance-spring result in a balance that beats at a rate of 21,600 V/h on 7-days (168-hours) of power reserve. I love everything about the Récital 9 except its exclusive price. The list price is over $168,000, making it inaccessible to all but the luckiest 2%. But for two weeks, I knew what it felt like to wear the best. During the first days as its custodian, I imagined that the Récital 9 should only be worn on the rarest and most elevated occasions. Perhaps only worn while jet-setting, or fine dining at a Michelin restaurant, or to a gala, or a night at the opera, or important social functions. 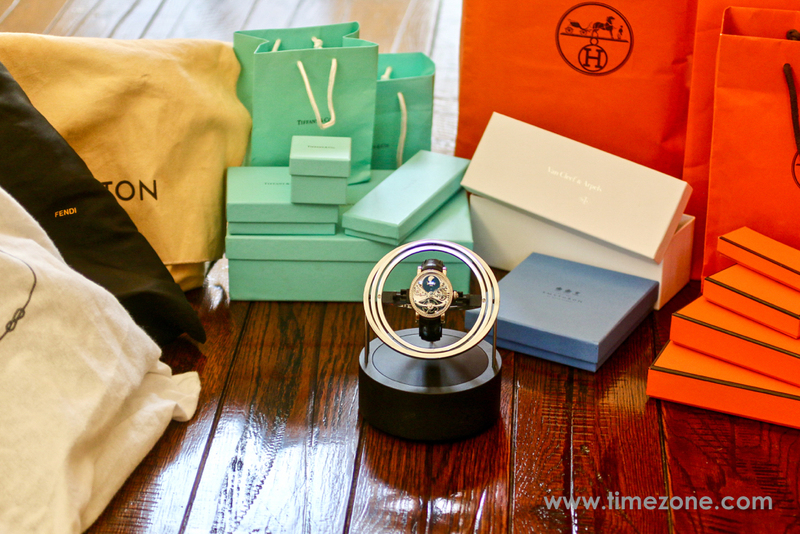 However, by the second week, a girl could get used to living with a tourbillon. I felt like it could be worn everywhere since the Récital 9, in itself, is the special occasion. Everybody knows that I wear a watch; however, nobody knows what I'm actually wearing. This was so liberating because I wore the Récital 9 to work, to a PTA meeting, to soccer games. 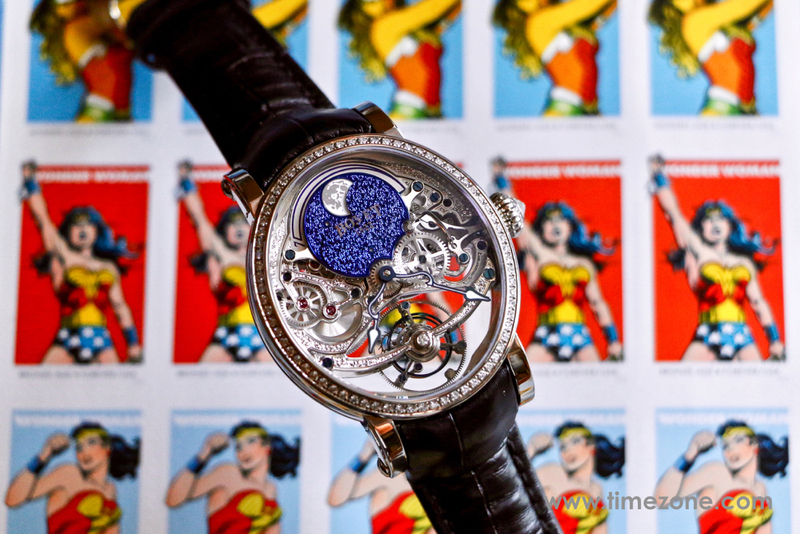 It's a superwoman watch in a complete sense - it's for the socialite, the mother, the entrepreneur. 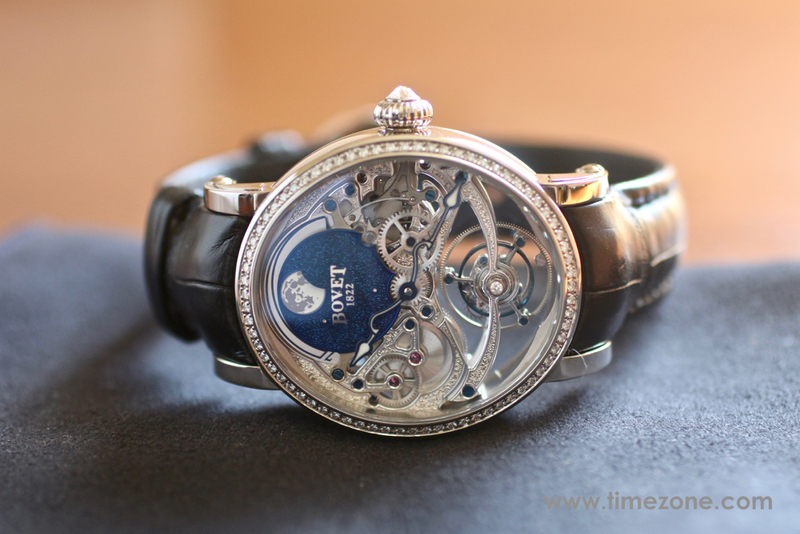 It would be a shame if the Récital 9 spent more days on a shelf than on a wrist. 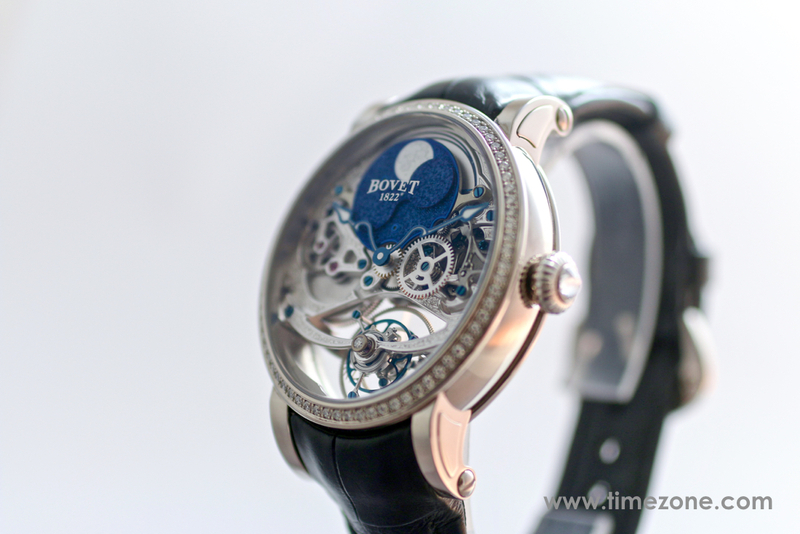 The Récital 9 should be worn often & regularly since it is extremely well built, high functioning and gorgeous.